Last night I was doing some research and went to pull up the Ruby On Rails site. Unfortunately when I did I could not connect. My DNS server wasn't resolving it properly. Assuming it was Verizon's problem I embarked on a long and ultimately fruitless attempt to find out why rubyonrails.org was not resolving. While doing this I tweeted about it and suddenly got responses from people explaining that there were some problems with that domain name. It wasn't the Verizon DNS server after all. My wife and I were going through our morning routine, eating breakfast and reading the newspaper when suddenly she said "I can't believe Apple!". We share many core beliefs—especially on politics—so I usually give her a nod, offer a "Yup" and continue reading my section. Wife: "They have a shaking baby iPhone application!!! This is outrageous!" Me: "Honey, Apple didn't make that application." Wife: "Well they had it in the App Store. That's just stupid." I completely understand that Apple is generating some significant revenue from their App Store sales and that it has become a major part of their strategy moving forward. The problem as I see it is that Apple is putting itself in a very precarious position. Instead of just worrying about whether or not the application will break an iPhone, chew up resources, etc. Apple now has to worry about the content. When I switched to Mac from Windows I had an adjustment period. The window model is a bit different, the menu is in a different location, the Dock Bar != the Start menu, etc. Those all took a little adjustment period but I quickly overcame them as obstacles to productivity. 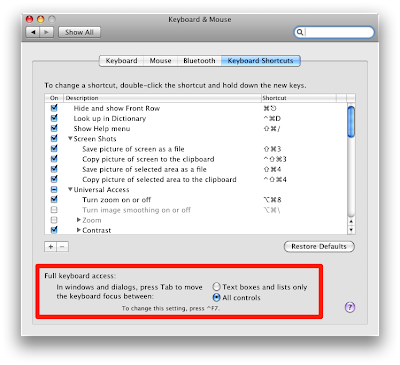 By far the longest adjustment period involved the use of the keyboard and more specifically the use of the Tab key. For a while now I've been using TweetDeck to access my Twitter account. While I love many of the features that TweetDeck has made popular I always struggle with the UI. Though it's quite usable the fact that it's built on top of Adobe Air means it doesn't look quite right on my Mac's OS X desktop. I've tried a number of different Twitter clients for Mac but none worked quite as well as TweetDeck did for me. Then along came Nambu, which is still in beta. Nambu looks and feels like a normal OS X application. The design is similar to TweetDeck in some respects but has some key enhancements that make it much more powerful. I'm finding myself using Twitter more and more these days and not for putting out tweets about what I'm doing at the moment. Twitter is slowly replacing my RSS reader as my vehicle of choice for news I care about, whether it's general, technical, Mac specific or sports related. I've used it to promote my new company (SharedStatus), chat with friends about topics I care about, help people with Mac and Ruby on Rails specific questions and generally build up a network of people I like to chat and network with. I can ask a question on Twitter and usually get an answer almost immediately. I always ignored URL shortening services in the past; what was the point? My e-mail systems always seemed to handle URLs automatically, forums that I frequented usually shortened the URLs for me and more often than not if I needed a URL in a blog post I created a hyperlink. It wasn't until I started using Twitter quite a bit that I started to appreciate a really small URL. When you have 140 characters to express your thoughts and you are as verbose as I am, every single character counts. Not long ago I noticed a buddy using Bit.ly to shorten his URLs. Up until then I always thought of TinyURL.com but 5 fewer characters in the domain name alone is substantial so I thought I'd give it a try. I give it my long URL, it gives me back a short URL and then I send that out to people. End of story, right?